I can deal with a lousy oven. I can use crummy cookware. And I’ll admit that I can bake a cake in a flimsy pan. But I refuse to use a dull knife. It’s not only that they’re hard to use, but a bad knife is downright unsafe. Some people are terrified of sharp knives when in fact, when used properly, they’re actually safer: Most people cut themselves when a knife slides off something they’re slicing rather than when it makes a clean cut right through it. Professional cooks bring their own knifes to work and take care of them themselves. It’s something I still do to this day. And when I go away for a weekend to someone’s house in the country, if I plan to do any cooking (which I usually do), I bring along at least one knife of my own so I know I’ll have a good, sharp knife to cook with. There’s a lot of knives out there, some are crafted by hand and really expensive, but you can do well with a few inexpensive options as well. I list my favorites at the end, but to prove my point, one of my all-time favorite knives, the yellow-handled paring knife (below), costs me about 99 cents, and can be found in hardware stores and supermarkets in the states. I’ve had mine for about thirty years and it’s still razor sharp. When I moved abroad, and into a much smaller kitchen than I was used to, I had to pare down (no pun intended) to the necessities. Yes, it’s nice to have an impressive arsenal of knives at your disposal, but for most home cooks, there are three that are truly important: a chef’s knife, a paring knife, and a serrated bread knife. You can certainly add more to your collection, but those are are the three that I reach for constantly, that take care of 90% of most kitchen tasks. No matter what quality of knife you buy, taking care of it will make the sharp edge last a lot longer. There are a few home sharpeners around that get mixed reviews: many knife aficionados say one should only have their knives professionally sharpened, or if doing it yourself, use a sharpening stone. I’ve had professional sharpeners ruin my blades by grinding them down too much, so I prefer to do it myself and I used to use a sharpening stone, although I’m now a fan of another device, which I mention below. And for most non-professionals, those devices do just fine. The first place to begin with, for keeping your knives sharp, is to start with decent knives. Sure it’s great to have very expensive cutlery, but just because they’re expensive, doesn’t mean they’re right for you. (I use a $399 ice cream maker because I churn a lot of ice cream, but most people would get along fine with the $49 model.) Don’t worry about impressing the cool folks on the internet with how much you can spend on culinary equipment. Buy what feels right for you, and what fits your budget. You don’t need to spend a fortune to get a good knife but the best place to spend money is on your chef’s knife. I’ve had most of my knives for thirty years and they’ve all proved to be exceptional investments. A well-made knife will last a lifetime, so I hereby give you permission to go out and buy yourself a good knife. In my opinion, you can do well with an inexpensive paring knife. But a cheap chef’s knife doesn’t quite cut it. (Pun intended.) Paring knives with plastic handles are fine if you’re on a budget, but I really prefer quality larger knifes with sturdy grips because they tend to be better balanced and easier to hold, which makes them safer. So I generally opt for synthetic, composite or hardwood-handled knives. Full-tang is a term you’ll hear, which means the blade goes all the way down through the handle to the end of the grip. Forged knives means the blade is made from one solid piece of metal. Both are signs of a better-made knife. (The Sabatier website explains forging well.) Once again, it’s much more important in a larger knife than a smaller one because you’re doing a lot of chopping and heavy-duty work with a knife of that size. Japanese knives have become popular lately, often made from one piece of metal, including the grip. Some people like them, while others find them awkward and expensive for what they are. Personally, I’m not a fan of them because they’re too small for my hands and I can’t get a good grip on them. The best way to protect your knives is not to damage them in the first place. 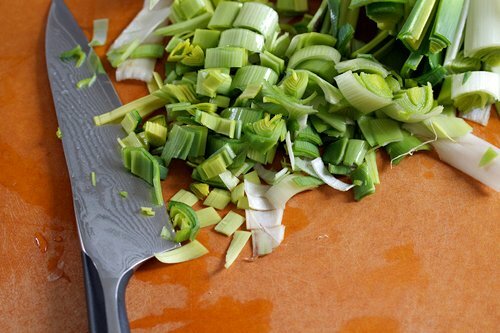 Regular tasks, like chopping vegetable and nuts on a cutting board, won’t wear down the blade quickly. Always use a cutting board; never cut on a marble or granite counter. You’d be surprised—I’ve seen even professional people do it. Knives come with either carbon steel blades, or stainless-steel. Aside from reacting with certain acidic ingredients, carbon steel will rust if left wet. Stainless-steel blades won’t rust and you won’t have any problems preparing citrus or slicing onions, but a carbon steel blade does hold its sharp edge better. However it’s become rarer to find knives made of carbon steel, most likely because they require more care. I have one, that’s very old, and very sharp. But I make sure to take good care of it. 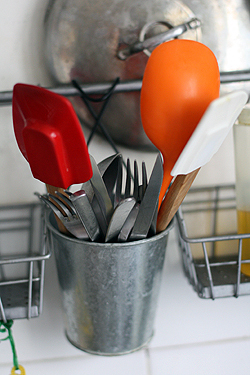 Hand wash your knives, but don’t drop them in a sinkful of dirty dishes where they’ll get knocked around. Wash each one in hot soapy water. After washing, don’t put them in a cramped drying rack with other silverware to dry, but lay them out on a dishtowel or hand dry them individually. Never, ever run knives through the dishwasher. Not only can they bang together, which damages the blade, but the heat of the machine causes the metal to expand and contract, which affects the blade as well. 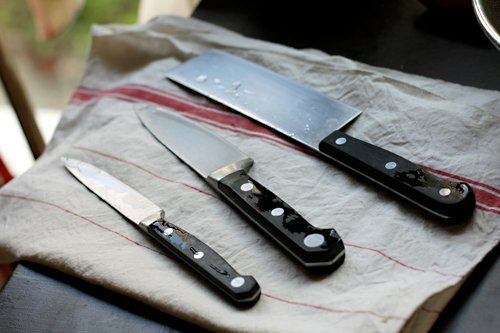 Once knives are clean and dry, put them into a knife block or plastic sheath to protect them. A few people have asked me over the years about what kind of knives I recommend. Of course, what I like may or may not be right for you. I’ve listed some of the major brands of cutlery at the end, and most of their websites have additional information not just about their knives, but about how to select knives and what to look for in a knife, as well. Here’s a round-up of the knives that I have in my kitchen. They range in price to suit various budgets. I have a few pricey knives, including those made by German manufacturers. For less-expensive options, Victorinox/Forschner is a good brand, and their knives are well-made for the price, and sharp. (They make Swiss Army knives, if the name sounds familiar.) Oxo also makes inexpensive knives, too. And I am surprised at how sharp mine has stayed over the years. 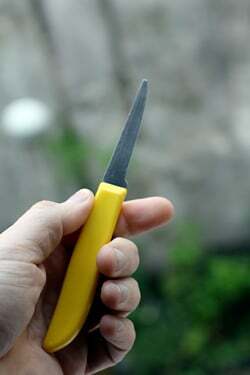 Mini Paring Knife: These are really inexpensive and I’ve never had one lose its edge. Known as the Quikut knife, you can find them cheaply in supermarkets and hardware stores, often for a dollar or so. Serrated Paring Knife: I discovered these when I worked in the café at Chez Panisse. Because there wasn’t a lot of space, it was nice to have a knife that was small, but stayed sharp. 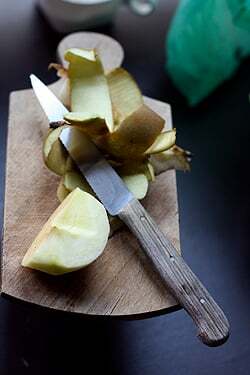 The one I use, as shown in the photo, peeling apples, isn’t made anymore, like my favorite knife. But this 4 1/2-inch knife is similar, made by Victorinox, and is less-expensive. Paring Knife: A 3 to 4-inch paring knife is a knife I use daily. I got mine at Columbus Cutlery in San Francisco way back in 1983. The owner talked me out of a more expensive German knife and I loved this knife until I lost it. (See? I told you not to lend anyone your knives.) Then, ten years later, it turned up in a silverware bin at the restaurant! The brand is Constant, but I don’t know if they’re made anymore. For paring knives, I prefer the ones with sturdy handles ($29) to the less-expensive model ($9.99). But many knife companies offer deals on paring knives to entice people to become familiar with their brand, which in turn, means they might by more in the future. Many cookware stores often sell paring knifes like this, located near the cash registers. 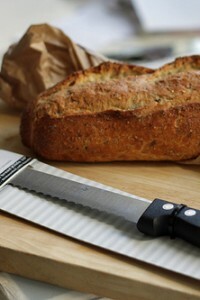 Bread Knife: I’ve had my rosewood handled bread knife for over thirty years, which I got when I had to cut through the firm crust of a lot of loaves of levain bread in the restaurant. The same knife costs a bit less with a plastic handle. Serrated bread knives are also great for chopping chocolate. I once picked up a Fiskars bread knife at a swap meet in a Berkeley parking lot for $7, and it was great. However the offset, orange-handled model I bought doesn’t seem to be made any longer. Boning Knife: I still have this from my restaurant days, although it’s not something I use often. In France, the volaillers will break a chicken down for customers and I prefer to let them do it, and clean up the mess. So I rarely use it, and it’s not necessary for most people. But I do own one. Chef’s Knife: These knives have 8- to 12-inch blades and each person prefers a different length. This is likely the knife you will reach for the most and I think you’d be wise to go into a cookware shop and pick the one that feels best in your hand. For those on a budget, I like my Oxo 8-inch chef’s knife. It’s not full tang, but is very sharp and well-balanced. And for $19.99, it’s a bargain. I’ve never once had to sharpen it. 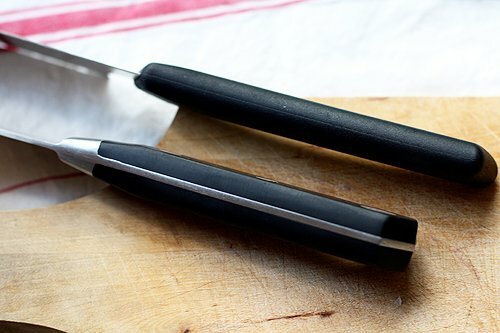 I have a French Sabatier that I use, although I reach for it less often than my Oxo. Japanese Knives: I have two of these knives, which were given to me by a friend who worked for Calphalon. I likely never would have bought them (who even knew they sold cutlery? ), but I’ve found myself using them all the time. The blade are very sharp, they’re well-balanced, and the handles fit my hand perfectly. As mentioned I wasn’t a fan of certain kinds single-piece construction Japanese knives, but these handles are sculpted differently and fit my grip well. These are good value knifes, made in China from Japanese steel blades. The Nakiri 5-inch knife costs less than $30 and the more refined Honesuki pointed knife has a tapered blade, which makes it good for slicing vegetables. Both of these knives have blades that need to be washed and dried right after use, but I’ve seen them sold in discount stores in the United States, like Marshall’s and Ross, at extremely attractive prices. Scissors: I’ve become a fan of scissors, mostly because of my Asian friends, who were always using them to cut whole chickens. I use mine to snip herbs, trim sheets of parchment paper, and to disassemble the roast chickens I get from my market. I upgraded myself to a good pair (which cost around $15) and use them daily for many tasks. Get a decent pair, since you don’t want to have to replace them. Most cookware companies, like KitchenAid, Wüsthof, Oxo, and Henkels made good ones. I got a pair at Ikea, which aren’t bad either. Knife Sharpener: I was skeptical at first, but my friends Judy Witts Francini, a Tuscan cook, and Tricia Robinson in Provence, both have been using their Furi knife sharpeners for years and highly recommended it to me. So I bought one, and you know what? It does work well. Another handy little tool, the AccuSharp works well, too, and is less expensive. Protective Knife Sleeves and Sheaths: For those who wish to store their knives in drawers, or if you plan to pack a knife with you on a weekend road trip, as I do, I recommend an inexpensive set of plastic knife sleeves. Notes: The prices mentioned in the post are for informational purposes and are subject to change. You may wish to shop in your local cookware store, which will allow you to handle the knives so you can feel which one is best for you. In San Francisco, I recommend Columbus Cutlery, a small shop packed with cutlery. Most major cities have cutlery shops. Tip: ask your local restaurant chef where they go. There are also many cutlery dealers online. For those on a budget, check local ethnic markets, which sell sturdy cleavers and other cutlery at attractive prices. What’s your opinion on a magnet strip? We’ve used one for years – the knives are handy, they don’t get banged around and since our kitchen is teeny, there’s no block to take up space. And isn’t it a whet stone? Sharon: I have a little bit of fear of those magnetic strips, just because (perhaps irrationally) I think the knives might slip off when I’m grabbing one. Plus I have no wall space, so I use a block. I have had my current set of knives for about 3 years and they are great. I keep them really sharp and I actually find food preparation fun. I bought a whole knife block but only use about 3 out of the seven knives. I think you are right good knives are really important. Do you know about the “Colbert Bump”? I wonder if there is a David Bump in sales after your posts! Before I even finished reading this post I went to Amazon and bought the Furi knife sharpener! (One-click shopping is WAY too easy). BTW, does one ever need to sharpen a serrated knife? David, I think your post will be very helpful to home cooks. As a kitchen knife collector, I would like to add a few remarks. I have found when I teach that very few of my students, and in fact many professional cooks, don’t know how to care for their expensive tools. A knife steel is not a sharpener. It aligns the molecules along the edge of a sharp knife and helps maintain the sharpness. During my years teaching at La Varenne Cooking School, the French chefs I worked with always began the kitchen day steeling their knives as they brought them out of their kits. It is a very sensible practice as it saves the need for frequent sharpening. If you try slicing a tomato before and after steeling a knife, you will be surprised by the difference. At school we received all the sharpening gadgets, and as a chef I tried them all and they are all pretty inadequate. My father was a hunter, and he showed me how to sharpen knives with graduated oil stones. Water stones are a close second, and less messy. In a pinch I’ll use a diamond stone if there’s nothing else, but normally I travel with a small oil stone. Avoid the sharpening gadgets. The electric ones are grinders and do a lot of damage to the blades. If you are serious about your knives, learn to sharpen them using a stone. I have explained the technique in a document for my students, but it is easier if you watch someone who knows how to do it. Better yet, promise them a cake or something if they will do it for you – I have lots of offers like that! I cook every day of the year, often for huge crowds, and I only do a mass stone sharpening of my knives only once a year. I save it for a dreary day and crank up the music. A quick steeling of my knives keeps the edges sharp otherwise, unless someone has purloined my knife to scrape the floor or something. I found my boss doing that on one occasion. Also, never use your knife as a screwdriver. I don’t know how often I see smart people prying or twisting their expensive knives in non-food related activities, and breaking off the tips. And never cut plastic with knives! Plastic is one of the natural enemies of the sharp knife. Which brings me to: plastic cutting boards. I know, manufacturers want us to think that plastic is more hygienic, but studies prove otherwise. Plastic cutting boards really dull a knife fast. Wood is the best cutting material for maintaining your knives. Disinfect the board after cutting meats by using vinegar or (if you must, but not eco-friendly) bleach. I’ve used the magnet strips at home, in restaurants and in schools and a knife never fell – not even the heaviest one – unless someone really knocked it. They do help protect the edge. You’ll see on old butcher tables a strip of wood attached to the side with slots to hold the knives. The point is to keep the knives separate. Wooden knife blocks are great but if you cook in a small kitchen in Paris where counter space is premium, like I do, the magnetic strips are a boon. I also found on Amazon a great wooden insert for drawers that holds a lot of sizes of knives safely. Just don’t pile them in a drawer where they’ll get knocked around, unless you have individual protective knife sleeves, the rigid plastic kind. The French are forging a very competitive answer to Japanese knives in Thiers. The brand is Stylver and to me they have a much nicer balance than either Japanese or German knives, and they are much less expensive. As David says, a lot depends on how the knife fits your hand. I need to update my website, so I’ll try to post my knife-sharpening document for those who are inspired by David’s very useful post. Great post, thanks for this entry. Very informative, I definitely learned a lot! What can get more annoying than dodgy knives! I relished this post. I grew up with a Mother who blunts knives, and is in fear of sharp ones. I love my kitchen knives that my Dad helped me choose, and that I look after carefully. Your comments on knife sizes is so right – I have small hands (I can’t span an octave on a keyboard) and my knives reflect that, as does my way of chopping or slicing onions as I just can’t hold all of a large onion in one hand. Chopping and/or slicing vegetables is a wonderful stress relief and a “wind down” after a hectic day! Thanks David for the interesting and very informative post! I’m gonna buy some new knives in the summer so this will help, I’m sure. I guess I just have to go to my cutlery shop and try some out. Knives are such a personal kitchen tool. The one someone finds perfect may not suit you. I have had knives from Zwilling J.A. Henckels and have been very satisfied with them. Scissors are essential in the kitchen. I’ve always had Fiskars which I think are excellent. You may not be familiar with the US brand of Cutco, sold s few different ways, either online, in their own catalog or via door-to-door. The company is based in New York state. They have a lifelong guarantee and give provide sheaths and have a return policy that if anything should happen to their products, return it either for sharpening or replacement. Period. Their knives are full tang. I bought a few as door-to-door from friends of my kids when we were in NJ and they were learning sales. They were given and taught extensive demonstrations about the quality of the product. I was very much skeptical at first, and then finally bought a few. They are not cheap, but have been really amazing in the kitchen and I also recommend them. Just be careful if you’re out and about in the UK – it’s illegal to carry knives here, even if they are obviously kitchen knives. We have knife crime, rather than gun crime. Having said that, I always pack a sharp knife if I am going on a self-catering holiday, and my trusty knife-sharpener (the best one I’ve ever found, can’t remember where or when I bought it, but it seriously does the job). I try to leave the knives in the apartment sharper than I found them (not difficult! ), but usually use my own knives when there. Great post, David! Lots of useful information. Thank you. I was pleased to see you mention the 4 1/2 inch serrated knife. I have one in my drawer, that was given to me to be a tomato knife (by my mother-in-law, who believes you have to have the “correct” tool for everything) and I use it all the time (though rarely for tomatoes!). It’s great for cutting those smaller items for which the serrated bread knife would be too big. I’m going to have to look in to that knife sharpener you recommended. Randall: Thanks for posting that excellent information. When I had a lot of drawers (back in my American kitchen) I had those wooden knife slots, and loved them. I do have to say, although I was skeptical, those two knife sharpening gadgets work very well. I stopped taking my knives to people to be sharpened after the last person ground the blades down about 1/4-inch on each knife. Oof. On the wood vs plastic cutting boards; I did ask Harold McGee once which was better. He said that because wood has grains, bacteria can get stuck between the fibers and said the best hygienic cutting board solution is to run them through the dishwasher. Bleach sanitizes, but I invariably spill some on my clothes. So because I like to really make sure mine are clean, even though I love wood, I switched to plastic. Someone gave me one of these Epicurean cutting boards, but I didn’t like the way my knife didn’t slide easily when chopping, so I don’t use it much. They are made of some sort of compressed wood, but are designed to go in the dishwasher. Have you used one? Sandra: I love those Cutco steak knives & had a few when I lived in the states. The only problems is is that they’re so sharp, I was always afraid of cutting the plates! Dani: You can get serrated knives sharpened, but I never have. You need to bring them to a professional. I think it’s more expensive than sharpening a regular straight-edge knife. Lucky they didn’t lead me to the guillotine then and there. David, what kind of knife do you recommend for slicing tomatoes? I love really thin slices, but have a hard time with that. I was just looking to some knives to add to my collection. I currently have a really light, thin blade chef’s knife that’s amazing for cutting up vegetables, but I’d like a little more weight. I didn’t know Oxo made knives! Will have to look into their stuff. Great post. One thing I hate about a lot of cheap knives that people have is that they are often sharpened only on one side. This is really annoying when cutting something hard like a carrot because the knife doesn’t cut straight–it tends to veer off to one side. I heard that a lot of Japanese knifes, even top quality ones, are made like that. The only really good knives I have experience with are my set of Cutco knives (I was a salesman for a brief period of time), which were sharpened in a balanced V-shape, instead of a skewed shape. What is your experience with that? Also, I’ve been thinking about ceramic knives lately. What is your experience and opinion on them? I agree completely with knives most cooks use. I was gifted a block of Wusthof knives about 3 or 4 years ago. It took me a bit getting used to them because all I’d ever used was cheap mass produced Wal Mart knives up until that point; and I was more than intimidated in the beginning by how sharp they were. I reach for the chef’s knife, bread knife and the paring knife on a daily basis. The others pretty much sit there. I too had a favorite cheap paring knife until it mysteriously disappeared a few years ago after a dinner party. It was a cheap Pampered Chef paring knife. About $5. They don’t carry it anymore, which is fine. I’m rather happy with the way my paring knife performs now. As for sharpening. Man I had a rough time with the honing stick and and sharpening stones. I never could get the angle just right so everything was a little dull. I had them done professionally one time and it wasn’t any worse than what I did but it wasn’t any better either. Then I found this lovely gadget at the kitchen store down the street Wusthof Handheld Sharpener , and then my dull knife woes disappeared. By the way, I just found this blog about a week ago, and I’ve read back posts. I’m hooked. While I’m relinquished to living in an uneventful, rather dull, state side Texas city, I can dream. I have so many knives it would be ridiculous if it weren’t for the fact that my husband cooks alot, too, and collects knives like some women (like me..gasp!) collect cosmetics! He has a whet stone that he uses to sharpen our knives when they need more than my little gadget that I use for edging inbetween times can do. My gadget-sharpener is made by Radu and looks like two little wheels that overlap and are attached to a plastic base. You draw the blade between the edges of the wheels to re-bevel them. It works very well and only takes a couple of swipes down the full blade to make them razor sharp. It’s the best quick sharpener I’ve ever used! When I first cooked with my late MIL, I was intrigued by her technique. She turned her ancient ironstone bowl upside down and ran the blade of her knifes against the raw edge of the base at a, roughly, 30-degree angle. He knives (untreated carbon steel) were always razor sharp! She learned that from her (old country Norwegian) Mother! FYI…For those in Northern California, the Raley’s/Knob Hill grocery chain offers knife sharpening as a complimentary service from their Butchers. Like many devoted cooks (an amateur, in my case), I’ve accumulated way too many knives over the years. When I was a “poor student”, I bought high-carbon Sabatier knives, but slowly switched over to Wüsthofs. The Wüsthofs are great in many ways — hard as all hell, you can really work them hard and they hold up. If you need to cut through a bit of chine bone, or split a chicken, no problem. But sharpening them? Wow, what a workout. I’m glad I didn’t lose those Sabatiers, because I’ve come `round to appreciating the charm of those old-school knives. Yeah, they lose their edge faster, but they sharpen very easily. Yeah, they stain, but the patina you get on one that’s well cared for is beautiful. Great article David. Like you, I’ve been using the same knives for years. My trusty Wusthof chef’s knife is circa 1970, or so. I’ve tried lots of others over the years, but end up using the same two or three knives day after day, year after year, although I must admit, I’ve found the Wusthof santoku a very handy shape, which I use more and more in place of a traditional chef’s knife. I find too, that a good cutting board makes a big difference. I prefer end-grain maple, which is easy to maintain and very smooth. I have a fairly large kitchen, so my board of choice is an 18″ x 24″ x 2-1/4″ model that lives permanently on the countertop. I’m curious what brand the knives are in the first photo in your article. The ones with the angled butts on the handle. You don’t say, and I couldn’t find any with that feature through any of the links you included at the end of the article. Can you enlighten us? Thanks. I found a Kiwi knife in Thailand several years back and have been using them ever since. They are amazingly sharp and truly inexpensive. I’ve not looked, but friends have said they’ve seen them in Asian grocery stores in the US. If you find one stamped “Kiwi Brand” don’t hesitate. David, it’s one of the worst things about cooking in someone else’s kitchen that you have to use their inadequately kept knives. (Although maybe not a problem for you as your friends are probably more kitchen savvy than mine!) The thing I’ve found most important with keeping knives sharp is something Randall mentioned earlier, steeling your knives regularly. There’s a lot of confusion and misinformation about the nature of sharpening and steeling out there. A lot of people seem to think that steeling a knife does actually sharpen it, but really it just stops it from going blunt. I put together a blog post with some useful diagrams and links to some videos to show people some techniques for steeling and sharpening. And I went for Global knives myself. I haven’t tried lots of other brands, but these ones seem pretty good to me. If you regularly steel them they keep their edge for a very long time. What an interesting and informative post! Thanks for letting all that follow your blog know that you don’t have to buy the most expensive knives available…so many people think you have to make a huge investment to get quality knives. Thank you for your down to earth views and opinions as a wonderful teacher! You can make yourself some stylish/creepy knife sheathes out of cardboard and electrical tape, if you’ve got both lying around: just get a piece of cardboard as long as, and twice as wide at the widest point as, the knife, fold it over, and wrap it tightly in the tape. Of course if you do this you have to be even more vigilant than usual that the knife is really fully dry before you put it away. Ben: I’ve only used ceramic knives a few times and perhaps it’s irrational, but I’m wary about using something that might break. People do like them, though. I just don’t own one of have much experience with them. James: I have a Wusthof santuku knife and that’s one I bring when I travel, like to someone’s house on the weekend, since it’s so versatile. I didn’t mention it because the post was getting long, but I like mine, too. Amber F: Those 4-inch serrated paring knives work quite well. Many well-known manufacturer’s make them, and they’re inexpensive; cookware stores often sell them by the registers. Those Cutco serrated knives are really great for slicing tomatoes; they’re quite sharp, although I’m not sure where they’re available. The serrated paring knife I mentioned near the end of the post (for $9.99) is pretty great, too. I inherited a probably 70 years old now, Henckel chef’s knife from a family friend who was a professional chef. It is used almost daily and a dream to cut with. The “everyday” knives around here are a cheap Henckel paring knife-it was supposed to never need sharpening but that is soooo untrue. Also a Chicago Cutlery boning knife and a $1.99 serrated grapefruit knife. However the one I love best is the antique Henckel. The grip is perfect and the blade is long and always sharp. We use either the Chef’s Choice home sharpener machine or an oilstone. That was a great article, David, thank you for the knife/sharp tools education! I agree 100%. I’ve recently been taught how to properly sharpen a knife by a professional chef and now I can’t imagine who I used to endure dull knifes. Thanks for the suggestions! I would appreciate your thoughts on ceramic knives, ceramic vs. steel and cheap vs. expensive ceramic. Thank you, David. I needed this post. I checked out the links for both the Furi and AccuSharp sharpeners. The Furi is only $18 on Amazon. That isn’t a bad price if it will help me keep knives sharp and ready to use. I bought two Mundial paring knives at a restaurant supply house – inexpensive with plastic handles and they seem to be lasting. Anyone used these for an extended time? My husband went wild with knife sharpeners – I just dug out a MinoSharp that Global handles – has two places to pull the blade through – think I will try it for a while – has anyone used one? My neighbor brought be back an ULU from Alaska – now my favorite thing for cutting those pesky round carrots the long way or on the bias. It doesn’t take much force to cut easily. I’ll also grab this if I’m every attacked at home – it’s really sharp! Thanks for getting me going on sharpening my own knives – my husband has been after me for years and I do all the cooking – hate dull knives. Love this post! I also wanted to put in a good word for the Mac knives from Japan. They handle nicely and really hold their edge. They’re priced comparably to Wustof, which is to say they’re not cheap, but not hideously expensive either. My favorite knife for tomatoes is The T.V. Knife “Sharp as a Razor” which I purchased at the county fair, of all places. Super cheap! And super sharp! Slices tomatoes beautifully, but is not very good for heavier jobs. I’ve had a Forschner chef’s knife with a wooden handle for 25 years and it’s my first choice in the kitchen. Very informative blog David…thank you. I immediately emailed my sisters in Australia who will visit me soon to bring one of those Furi’s over for me…good on the aussies for that invention!! I like using ceramic knives on fruits and vegetables because the cuts don’t brown as quickly; I have don’t comparisons with a nice sharp steel knife. I bought three, a pairing knife, a bird’s beak pairing knife, and a small santuko. I bought the cheap black handles with black ceramic blades. The plastic handles are shaped just right to me, and I don’t find them slippery. They might not work as well for someone with big hands. I have never had knives stay as sharp for this long without touch ups. The subject of wooden or plastic cutting boards is hugely controversial. The assumption was that plastic would be superior to wood because it is easier to thoroughly clean a plastic one and so they would not harbor bacteria. Knife scarred plastic cutting boards also harbor bacteria. Fat, which can hide in these scars, can also provide nourishment for the bacteria. On wooden cutting boards, bacteria seem to be drawn into the boards and then they seem to die rather than breed. There is a lot of interesting reading on this topic. When I saw the picture of David’s favorite paring knife I thought ‘Wow! That’s just like my Pampered Chef knife!’ I have a bag of brand new ones left from when I was a PC consultant, over 8 years ago now. I’ve never needed them because the very first one I ever used is still working fantastically, even after going through the dishwasher. Jennifer–Pampered Chef does still make the Quikut paring knife. great and informative post. I love your blog and can’t wait to visit Paris one day! Still getting through my Rosetta Stone! ps I now think of you every time I use chocolate chips for cookies. i will never take those little morsels for granted again knowing how difficult they are for you to obtain! One of your photos shows a knife with a wooden handle that is splitting. It immediately brought to mind my favorite chef’s knife, a wooden handled (splitting) carbon steel knife bought at an haute Provence market for probably $20. We were renting a house and the owners were obviously not cooks (I couldn’t believe it, French who didn’t cook!) Anyway, I’ve been using the knife ever since – well balanced and very sharp when run through the Chef’s Choice electric sharpener. What a nice memory! amy: Oddly, I was at the market Friday and the folks that sell olives, nuts, and dried fruits had a large tub of chocolate chips, where they sell by the kilo. Some supermarkets sell them in tiny 4oz bags, les pépites de chocolat, but in the quantities that I use them, that’s pretty miniscule! Kim: A serrated knife is the way to go. If you have a block of chocolate, start at the corner and work the knife downward, keeping your fingers out of the way. It works great and is much, much easier than using a chef’s knife. 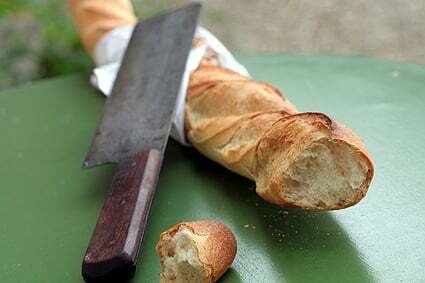 Bob: That carbon knife (with the baguette) is really old, and still really sharp. The blade is super-thin and I think it’s really beautiful. I recently bought a sharpening stone and learned to use it from the Rouxbe.com tutorial – excellent. My knives are now so beautifully sharp, plus I so enjoyed the process of sharpening! Once I got into it I couldn’t stop (kinda zen like) until all my knives were done. I am wondering ~ really? I can’t imagine sticking my Henkels in that thing but maybe my cheap Oxo knife. I don’t know. I appreciate the clarification regarding Japanese knives (I can be quite dense at times) as this was an excellent article that I want to use for reference. I checked my Wusthof knives which I have used for twenty years and they are in awful shape–I have done everything wrong (put them in the dishwasher, stood them on end in a ceramic mug along with other utensils, not used sleeves, etc.). Sad looking knives. Time to get a new set and treat them right. Thanks for this wonderful article and all you do in this entertaining and extremely informative blog. My grandmother used to use knives that wouldn’t cut warm butter — all because she was afraid she’d cut herself. I left her kitchen with bandaids on my thumbs nearly every time I used her knives. That’s the good and bad about having murderously sharp knives. They’re sharp, so you’ll almost never cut yourself. But when you DO cut yourself, it will be bad. AnnaZed: I was pessimistic too, but my two friends who are amazing cooks gave it high marks, so I picked one up last time I was in the states, and it works really well. Rachael Ray branded a few items with that company, including an orange-handled knife. People do knock her, but I’m impressed by someone who works as hard as she does. David, thanks so much for this post. I need to replace my chef’s knife and had no idea which one to buy. I think I’m going for the OXO 8 inch like you suggested. After every one of your posts I have so much for confidence in the kitchen and more fun too! This is off topic, but I was watching It’s Complicated (Meryl Streep) last night and noticed for the first time the Croque Monsieur that she was making. You posted about Le Nemrod’s Croque Monsieur on 3/11/06 but didn’t include a recipe. Have you ever made it and could you post a recipe sometime? Thank you — great blog! Thanks for the info, David! I do a lot of international traveling, and always take my own knife with me when I know I’ll be doing some cooking! For the year and a half overseas trip I’m currently on, I brought a Sabatier, but it got used by fellow researchers at my field camp, and is in desperate need of sharpening now! Can’t wait to get back home to my Furi! Also, looking forward to a trip to Japan in September, so I can check out some knives! I have small hands, so your problem with them may be my solution! Thanks again for all the great blogs and recipes! i looked at the screwy thing, only 2-3 inches long now. Both of the links in the japanese knives section go to the same amazon page. Great post – really really useful! I keep my sharpest knife in a protective cover that snaps over the blade as I’m worried about doing myself some damage! Thanks for the valuable info David! I use a sharpening steel to sharpen my knives and it has always worked perfectly for me. I got a present recently, a set of Japanese knives and they are incredible. I was amazed by their sharpness and how easy they are to handle. My old knives are ashamed to be in the same drawer as the Japanese ones. Yeah, I keep them in a drawer, I know I shouldn’t! Very helpful post. Thank you very much!!!!! David, Thanks so much for the tip on the Furi knife sharpener! I always read your posts but rarely post comments. This time I have to leave a comment here – what a fantastic post. You have talked about one of the things that worry me more good knife – what is a , how to choose a good one,good knife sharpening, etc.Fabulous post.Thank you. I love this post. You gave some very helpful information that I will be using to purchase several knives that I need. Thanks! Thanks for the knife tips! My boyfriend got an AccuSharp for Christmas. Even though it gets his knives really sharp, I was afraid to use it on mine. Now I can rest easy knowing my Forschner (not very fancy anyways) will be ok.
@ Michelle B — if you’ve got Wüsthof knives, you don’t need to buy new ones. Take them and get them professionally sharpened. They’ll be good as new! My mom’s had hers for over 25 years and gets them sharpened regularly, and they’re still razor sharp. Thank you, David, for the valuable information you gathered here for us! I have made it my habit to always – yes, always! 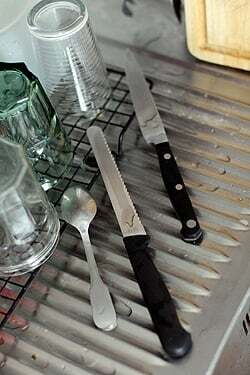 – to not only wash and dry with a dish towel my sharp knives, small and large ones, but to also immediately put them back in their drawer after use. I have had twice a close encounter with chef’s knives, one slipping out of my hand and almost hitting my toddler who was playing underfoot, and the other one starting slipping of the drying rack all of a sudden, landing at my feet, millimeters from my toes. This last one has a bent point ever since, a daily reminder to be careful and shoo dog and kids off the kitchen floor. Btw, your popover recipe is still the runner in our household, especially with the addition of a grated apple. Thank you for that recipe! I also take knives with me when I am staying elsewhere and know that I’ll be helping out in the kitchen (or maybe even be preparing everything as I do when I visit my father). What constantly goes through my mind when I’m in another kitchen is, how in the world do they do it? There really is nothing worse than a poorly made, dull knife. One slight additional piece of information – the angle of the blade edge on a Japanese knife is very different then the angle on a European knife (a much smaller angle), and when you are sharpening the knife, this needs to be taken into consideration or else you will grind your blade down very quickly. I don’t have one myself, but I see that among the electric knife sharpeners there are now models that are designed to handle both varieties of knives. Whether you use a sharpening stone or an electric sharpener, it is important to use the right angle for the blade. most effective to keep my blades in tip top shape. I have four beautiful wusthof knives that were a gift from friends several years ago and I am ashamed to say I have yet to have them sharpened: I’ve been scared to do it myself because I don’t know what I’m doing, and too lazy to take them to a professional. I just clicked on the furi link and I think thats the answer! Thanks! LOVE my Wusthof knives! Got them as wedding gifts 11 years ago and I know they’ll be with me the rest of my life! I’m fortunate to have a wonderful “blade guy” sharpener in my neighborhood. As a seamstress as well, I’m in double need of a good sharpener and not inclined to hand those tools over to just anyone. He was delighted to show me how he sharpens knives and scissors on different machines. He instructed me to NEVER take knives to a scissor sharpener and vice versa unless you know for certain they’re being done on separate equipment! I wouldn’t cut silk taffeta with a chef’s knife – why would I want my shears sharpened like one! But I’m anxious to look into some of the home sharpening options to keep the edges sharp between visits! Thanks for all the valuable info David – and from the commenters as well! In a full knive block, I have just three knives I use on a continual basis and I’d be lost without them. But, one thing I do to keep them sharp as long as possible is to place them in the wood block blade-side up. If you put them in blade-side down, you dull your knife by dragging the blade across wood. I generally use the chef’s knife for most of my cooking (my parents use the Chinese cleaver), and find that it’s sufficient. This post reminds me of a seminar I once attended where the presenter, like most chefs, emphasized the importance of sharp knives. He went on to say that it’s better to go to the dollar store and buy a new knife every week, than to live with a dull one. I didn’t quite take his advice on that, but bought a knife sharpener the next day. Regarding marble counters, it puzzles me too since marble is soft, slippery -and- porous. My mother actually puts a towel under the cutting board to reduce impact and prevent slippage. Elaine: I have a Chinese cleaver that Martin Yan gave me years and years ago. He came to a restaurant I was working at and asked me why I wasn’t using one of his knives–so he sent me one! But as mentioned, Asian housewares stores have rather good knives that are pretty inexpensive, and quite sharp. Margaret: I’ve not made a croque monsieur at home since it’s one of those things you really just go to a café and enjoy. It’s kind of not the same at home. But ever since you brought it up, I’ve been hungry for one. Hopefully I will remedy that situation in the next day or so! I’m glad to hear that you don’t prescribe to the idea that you have to get your knives professionally sharpened. I can understand the necessity of it for a restaurant but it seems too much of a hassle for cooking at home. Sadly, too many people don’t understand the difference between honing and sharpening. I’ve seen way too many people try to “sharpen” a knife using a honing steel. What an interesting post and discussion! I once brought my knives to a professional sharpener in Amsterdam. He over-ground–but the knives were also lethally sharp. You just had to breathe in the direction of the knives and whup, you had a surgically sliced finger. I agree with the previous posting about the Thai Kiwi brand knives. They are one of the most best knives one can buy, regardless of price (although they are max 5 euro). In Thailand, almost all ‘professional’ cooks, those who are cooking on the street, use these knives, from cutting meat to slicing fruit. I have a Kiwi knife that is a cross between a santoku and a Chinese chef’s knife, which is both unique and very practical. I have yet to see a ‘professional’ brand to supply a knife with this form. That said, I find that I am using the Chinese chef’s knife more and more, for perhaps 80% of my cooking. I have a Japanese one from Kai Shun, which is quite expensive but pretty and practical. After some practice, I can now even pull the outer layer of an onion with this knife and my thumb. I cook mostly European food, but these Asian knives are just marvellous and practical. @ David: love to hear what pans you are using. I have recently discovered Mauviel, and could not been happier. I mostly use All-Clad pans. They’re owned by a French company now (SEB), but oddly, they aren’t widely-available here. Perhaps because they’re made in America makes them a bit out of the price range of the average cook. And perhaps because they’re not really a household name here, either. I like them so much, I brought mine over from the states. I also have two heavy copper pans I got at a discount store for €15 each that I use on occasion, too. Excellent article and suggestions. I ordered the Furi knife sharpener and the serrated paring knife today on Amazon……….both are on sale. Thanks. I live in a far away country. I speak a different language. But I am addicted to your blog. My cakes are best when I follow your recipe. I could be in love with you if I were still a teenager. Dear, David. Your blog is great, but I had no idea you were a knife snob. This seems so American. Since leaving the U.S. 10 years ago, I have lived in several European countries and no one I meet ever talks about their kitchen knives or keeping them sharp like Americans do. Now living in France, I have eaten in more than a few French homes, and I never see them fuss over their knives, not once. My French wife’s mother uses an old Opinel for a lot of her cooking, and the food is always great. I love my Accusharp knife sharpener! 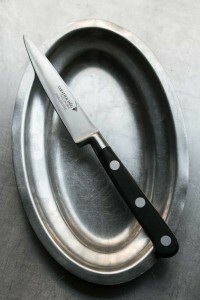 I haven’t used it on my good chef’s knife though, because it takes a lot of steel off the edge of the blade. I bought mine in the 60s in Southern California at Fedco, which alas is no more. I use it all the time and it is still perfectly sharp. I bought one for my daughter a couple of years ago on E-Bay, used, and it was fine also. Maybe you can find one in Sweden? A wonderful knife. Velops: Like anything, not all professional sharpeners do a good job. A few have ruined knives of mine. Chris: Am not sure what you mean by snob, but I recommended a knife that costs about 99 cents as a favorite of mine, a few others that cost less than €10/$10, and advised folks to visit ethnic housewares stores to scout out good knives as well. There’s plenty of knives that cost hundred of euros or dollars, but I don’t have any of them and don’t think they’re necessary or required for daily cooking tasks. Margot: That’s not the same one (I can’t find a photo of the one I had…) but I have a feeling they’re not made anymore. My favorite knife is stored in the glove box of my pick-up. It’s an old Opinel folding knife, great for road trips and picnics. And not expensive. On the other hand, when I am doing a few courses for about 16 people, there is nothing better than my well-balanced chef’s knife I have owned for over twenty years. Bought it at Bridge Kitchenware from Mr. Bridge himself. It is not how much it cost, it is the sentimental value accumulated over the years. How many great memories were prepared with that knife! Hmmm in my humble opinion, your blog David should have been up for a Beard Award and won. But now I hear you have to pay an entrance fee to get nominated!? have you ever watched the movie “Big Night”? parisbreakfasts: Thanks for your thoughts! I was asked if I wanted to be considered, but there is a fee to participate in the nomination process, so I passed. Besides, there’s so many great food and travel blogs out there that I think it’s pretty hard to choose one over the other; it’s so nice that we all have so much variety to choose from! Deborah: Ahh, Mr. Bridge. Now that’s a old memory. He was quite a character. btw: I was told that it’s illegal in France to carry a knife whose blade is wider than the palm of your hand. Haven’t had the need to test that law, but I carry a Laguiole knife myself. I’ve looked through your post but couldn’t find details for the knife in the top photo on the right hand side – in the style of a Japanese vegetable knife? In the last few years I haven’t been able to put down Mac knives – cheap, light, razor sharp (kept that way by their sharpeners) and well balanced. I L-O-V-E them! Can’t wait to get your new book! But it doesn’t sound like this is you. I’m happy to hear you enjoy 99 cent knives. I splurged last year – to my husband’s disgust – and bought a set of Furi kitchen knives. Love, love, love them. Previously I was using a small size chef knife that I’d had for over 20 years, and I still use this one as much as the larger Furi chef knife, and some awful knives that hubby had picked up in a discount shop. Unlike some of the cheap knives you recommended these one’s were awful! The Furi sharpener is great, although we do run the older knife over a whetstone every now and again. The Furi knives are just amazing, they make such a difference. Talk about kitchen confessionals! After reading your blog and then all the comments, and meanwhile thinking about the miserable knives hiding in my kitchen, it does make me think that talking about the knives we actually use is like sharing what is actually in our underwear drawers! You know what mothers always say, “don’t go out with holes in your underwear, in case you wind up in an accident and have to go to the hospital!” Well, I have no pride, I guess, so I will confess that I have never gotten the hang of sharpening, even though I have tried various methods and tools. So, I use serrated knives for pretty much everything! And the ones I use the most are whatever I can pickup at the market. When they loose their enchantment, I toss them and buy new. (They are generally cheap). But, my favorite instrument of torture is what I use for fine chopping fresh herbs. It is something my son brought back from Alaska years ago. It is a native fish cutting instrument, I think. They sell them there now on a stand for souvenirs, with Alaska printed on the wooden handle. The blade is shaped like a kind of triangle, with the blade side longer and curved. 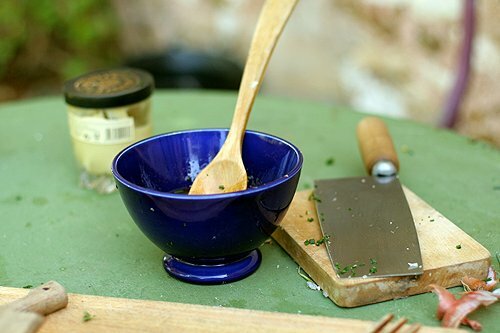 They have since begun selling something similar here along with a curved wooden bowl like a small salad bowl. But I like mine the best. It is smaller and I just use a cutting board. But, you rock the knife back and forth very fast and it minces parsley and any greens very quickly. I have used it for 15 years without sharpening. Love your blog. But, by the time I get thru reading your blog with comments and Ruhlman’s blog with comments, the morning is gone! And BTW, crank up that sun for me. Us so-cal girls don’t bloom in the shade! Pretty nice article, anyhow, I love japanese knives because of their lightness, sharpness and because they are easier to sharpen. I’m specially in to Mac -knives, but my favorite is three layered DP santoku made by Kaneyoshi, the blade is made of carbon steel but the sides are S/S. Also because I use both huge wusthof knives for harder jobs and japanese for general purposes, i can’t use those “pull through” -sharpeners because of different sharpening angles. That’s why I would recommend diamond sharpening plates. I also use ceramic rods for fine finishing. About knife blocks, i have found very unfamiliar of the fact that they most often support only one bigger chefs knive, any idea where to find a good one? Great article! Being a novice cook, I have much to learn and appreciate your style of writing – it’s simple and easy to understand! I have two question regarding knives. 1. For my birthday, my husband bought me a Chef’s Choice M130 knife sharpener. In reading the instructions (which are very limited!) “polished edge” and “steeled edge” are mentioned. Could you please advise me which edge I should put on my knives? Thank you! 2. I have a Wusthof and a Henkel knife. When I tried sharpening them, one side of the blade was distinctly sharper than the other side. (I used to have the ceramic rods knife sharpening kit and always only got one side sharp). Is this correct? My favorite paring knife, for years, has been the cheap industrial “tomato knife” made by Ontario Knife Company in the U.S. What I particularly like is the knife’s very short 1 3/4 inch blade length — much shorter than most paring knives. Great for cutting cores out of halved apples in one motion (á la Jaques Pepin), fluting mushrooms, cutting fruit, etc. A paring knife with a longer blade (I own some Henckel’s) just seems clumsier for almost all routine kitchen tasks. As for knife sharpening my father in law informed me of the Chef’s Choice 310 electric sharpener and of course I was quite skepticle. Well the device works brilliantly and sharpening seems to be fool-proof and my knives are like razors. One of the best appliances I have ever owned. Thank you, David. This is one blog post I return to again and again. I’ve used a very large, 9- or 10-inch, chef knife for many years and have recently decided to switch to a very small one. Since I’ve never actually used a 6-inch chef knife, I am hesitant to spend a great deal on one until I know that’s what I really want. This post made me decide on the very inexpensive Oxo Good Grips Professional 6-inch Chef’s Knife. Can’t wait for my order to arrive!